Brilliant composition – the red 'pops' amongst the frosty 'foliage' in the scene. I just love it when winter just shrouds the land like this! Beautiful saturated colors and so clean! Our small amount of snow is being washed away today by driving rains. ow wow, so perfect. we had that kind of snow here last week, the kind that sticks to the trees and looks so pretty. you captured it perfectly. Unusual composition! Very wintery and very nice! Its Beautiful!! But better wrap up in several layers before you go out for a snowball fight. Gorgeous winter wonderland composition. Like the touch of red contrasting with the pristine snow. Excellent shot Frida. Like a real winter wonderland! That red is amazing in the snow, what awesome scene! This is so gorgeous and lovely compo . Oh wow, that's so beautiful! 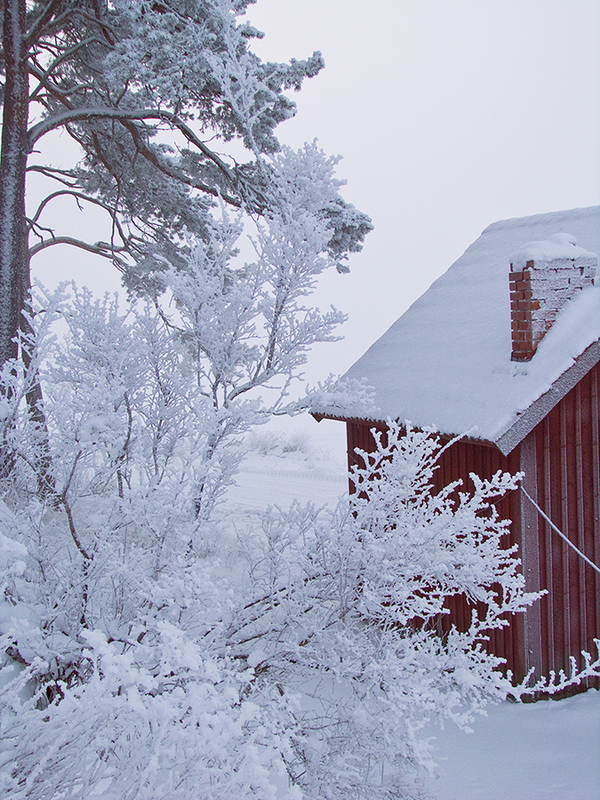 Love the accent of the red house between all that white … a perfect winterwonderland! What a stunning winter scene. Love the combination of the red and the grey tones. That is a magical shot. Wonderful. Such a delightful winter scene. You make the snow so appealing. Superb winter scene. Great control of light and perfect overall sharpness. This is quite a lot of snow.The red house stands nicely out of the snow. wonderful view, (the light from the background is just like Heaven) so simple and wonderful ! A winter wonderland!! How absolutely beautiful!!! The hoar frost gives the tree limbs a filigree look that is very appealing. A beautiful shot. and snowy too. Wonderful winter shot. I can feel the cold. Great photo! This is wonderful! Fantastic snow and tree and splash of red color! Beautiful! Wow, Frida. Full color and nearly black and white. Love the inclusion of the brilliant red.